It’s common to hear a small noisy segment of the citizenry complain how the elk population is down in the southern Yellowstone Park area. In addition, climate change has slashed moose population in and around Jackson Hole, but there is good news about the pronghorn antelope numbers. They have climbed to a near record in Jackson Hole and also in closeby areas such as the Gros Ventre River canyon. 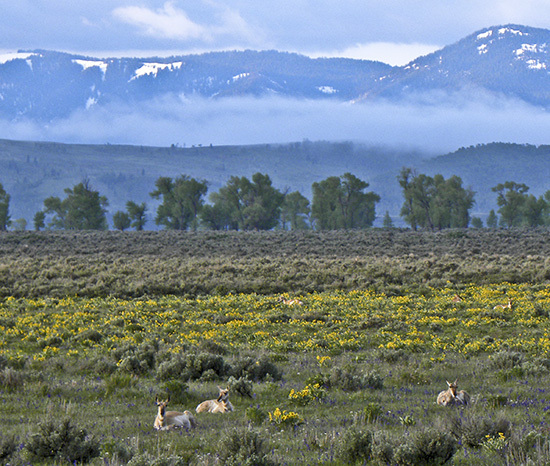 The pronghorn migrate into Jackson Hole in May and back out in autumn, and this long migration trek has been threatened by development for years. Fortunately conservation actions have been taken to thwart developments. No doubt other, additional, factors are at work too to bring the good news of this year. For details see, Valley pronghorn population approaches record level. Yellowstone summer elk count takes a dive. in the Jackson Hole News and Guide. By Mike Koshmrl. Good news indeed given the need of this species for a certain “critical mass” in a given area for herd health. Given that the coyote is the primary predator for these fawns, and that wolves supress coyotes, one could argue that this a positive wolf impact. I am not sure it trumps the very significant elk decreases however (or should…). An illustration of the complexity of the wolf issue and all its unintended/unexpected consequences. Now read this the other day in the local paper, what Great News! Please take the spin out of the article. Report that antelope population is increasing…. possibly as a result of wolves. Great and enough! I can do with out the negative; ‘small noisy population’ and the presumptions; ‘climate change has slashed moose populations’. I visit the site for news and information. Not the author or websites opinions or political stance.